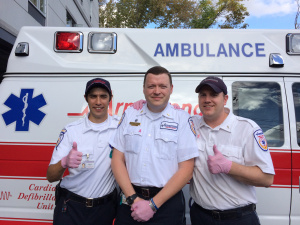 Armstrong Ambulance Service Inc. medics, EMT’s, and other first responders are donning pink exam gloves all month long in support of National Breast Cancer Awareness Month. Nearly 12 percent of women in the U.S. will develop invasive breast cancer during their lifetime. This year, more than 300,000 total cases of invasive and non-invasive breast cancer are expected to be diagnosed in women, and nearly 2,500 new cases are expected in men. Nearly 40,000 women will die this year. Breast cancer is the second most diagnosed form of cancer in American women, second only to skin cancer. About Armstrong Ambulance Service Inc.
Based in Arlington, Mass., Armstrong Ambulance was founded in 1946, shortly after Bill Armstrong returned from his tour of duty with the U.S. Marine Corps. While living at home, he watched his mother, a registered nurse, care for friends and family when they were injured or sick, and was inspired to follow her example. As the company grew, Bill earned a reputation for care and compassion, and quickly became an industry leader. He was instrumental in forming the Massachusetts Ambulance Association, developed to ensure the highest standards of care by ambulance services statewide. Today, Armstrong employs 300 highly-trained emergency medical services professionals, and provides EMS services to 17 communities in the Greater Boston Area, responding to more than 45,000 emergency calls every year.